alaTest har samlat in och analyserat 230 tester för Samsung HMX-H200. Det genomsnittliga betyget av denna produkt är 3.8/5, att jämföra med genomsnittsbetyget 4.0/5 för Videokameror. Zoomen och bärbarheten får positiva omdömen men sökaren uppskattas inte lika mycket. Vi har analyserat betyg från experter och användare, produktens ålder och andra faktorer. Jämfört med andra Videokameror belönas Samsung HMX-H200 med en alaScore™ på 86/100 = Mycket bra kvalitet. Samsung adds new sensor technology to improve image quality, but still keeps the emphasis on value. Samsung's HMX-H200BN is an HD camcorder with a 3-megapixel CMOS sensor, a lens with 20x optical zoom and SSD expansion capability. Samsung's latest entry-level camcorder only shoots 1080i HD video but has a tempting price tag. Is it an upgrade from your Flip? 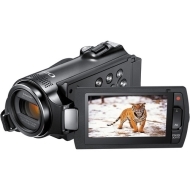 A very capable camcorder that excels in both video recording as well as capturing still images. The audio isn't the best but, the Samsung HMX-H200 is a simple, inexpensive camera that works great for capturing memories. Simply put: it covers the basics at a low budget. Der Samsung HMX-H200 ist ein HD-Camcorder mit Speicherkarte (ein Steck­platz). Klassische läng­liche Bauform (horizon­taler Camcorder). Günstig. Liefert gute Videos (Note: 2,5). Guter Auto­fokus. Full-HD-Auflösung, 20-facher Zoom, ein Touchscreen und dazu noch ein vielversprechender neuartiger Bildsensor: Der Camcorder HMX-H200 von Samsung hat potential. Sein neuer BSI-Chip soll mehr Licht aufnehmen und bessere Bilder liefern. The HMX-H200 boasts an impressive list of advanced features, offering unparalleled value to consumers looking to experience high-quality, full-HD video recording at a competitive price. The camcorder features Samsung's BSI CMOS imaging sensor. Designed to absorb more light than other conventional sensors and deliver unprecedented low-light performance, the BSI CMOS sensor sets new standards for performance and image quality, particularly among entry-level camcorders. The HMX-H200 is also loaded with a range of unique features such as the ability to capture high-quality 4.7 mega-pixel digital still images, Smart Auto mode, which automatically selects the appropriate scene mode which will produce the best results possible for the user's shooting scenario, as well as time lapse recording, an innovative setting which will give end-users the ability to take their creativity to a whole new level. When using the camcorders' time lapse mode, consumers can program the H-Series camcorder to record a single image at intervals of one, three or five seconds, and then save each image as one single movie file (720p resolution).